Well, here is the second part, and my list of unread posts in Google Reader is finally back to zero! Now to tackle the work email in-box, where I keep getting automatically generated "mailbox full" notes! Iris Jastram always writes thoughtful pieces. (Often they are based in her real-life experiences.) She recently posted about her philosophy of librarianship. It is well worth reading, it notes the important role of librarian (especially reference librarian) as generalist. In fact, it makes me think that once upon a time when I was part of a team doing book selection, we made it a point to include one of the support staff who worked the circulation desk (and handled ILL). She brought some of that real-world grounding to our work. One of the library humor blogs on my list is obnoxious librarian from hades. Its subtitle is : a satirical look at life in a large bureaucracy. One of the more recent posts, while posted as a satire, really pegs the state of e-books and libraries today. I mentioned here that Abigail Goden is doing a series of "Data Friday" posts which continue this week. The most recent post talks about a book published in the UK (and soon to be published here) about access to web data. It is true that you get out of professional development what you put into it. Anything that you can use to further your career, enhance your skills, or support learning and progress in librarianship counts as professional development. There were a couple of posts about mobile apps and libraries. First from Bill Drew who casts his headline as either/or between mobile apps and mobile web sites. It turns out that he refers to two separate articles in Computers in Libraries each of which tackles one of the two topics. Based on his comments, the web sites will be easier to produce in the short run. I wonder how long the "apps" portion will be relevant. Aaron Tay has a fairly long post about mobile friendly databases being offered by libraries. He notes both of the trends talked about by Bill, but focuses on database access as provided by our vendors (i.e. not library created). Because he is a librarian in Singapore, he takes a (literally) more global view than do many other bloggers I read. The first is on the value of a book. The post includes graphs and some sophisticated economic analysis. I'll probably have to read it a couple more times to really understand it. The second is about his new venture which is the process of raising money to make creative-commons licensed ebook editions of the books ... so that everyone, everywhere can read them. The third reflects on the sense of smell. I have often heard that it is the most powerful of the senses in memory recall. I have certainly experienced that in my life, times when just an odor brings back a very strong, vivid memory. One of my favorite quotes is: "When we smell a book all of these feelings resonate across time and they comfort us." Finally, Eric posted about orphan works and finding the true copyright holder. He noted that the Hathi Trust had proposed posting some orphan works. The Authors Guild then sued them. As part of their prep, the Authors Guild used its membership (and blog readership) to identify many of the authors not found by Hathi Trust. Eric's post is full of links. I had an "A-HA!" moment recently. I was at a mandatory training at MPOW where we were going over the procedures for evacuating the building. Always important to do this, and October is Fire Safety Month (or something like that) when a lot of fire drills take place. One of the unintended consequences of loosing staff, is that there are fewer people in the building, and there may be parts of the building which used to have staff present, but no longer do. That happened at MPOW, so some of the evacuation plans have now been tweaked to make sure that we do get everyone safely out of the building. I started this post thinking it would be a short one with a few links...it is now turning into a two-part post. Here is "volume one." First some humor. While most librarians know about Unshelved (along with its computer programing cousin/half-brother Not Invented Here), one of my favorite library humor sources is Shelf Check. It has not been as frequent of late, but the latest is a great one. 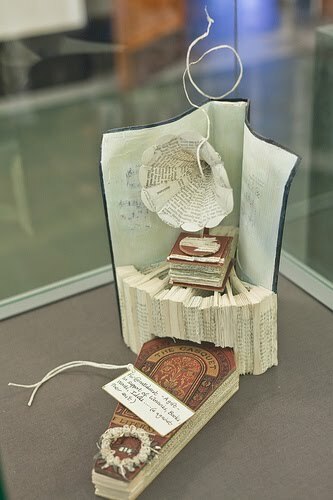 LISnews alerted me some time ago to the wonderful book based paper sculptures which are popping up (literally) in libraries around Scotland. It started in March, and the most recent (that I have learned about) appeared at the end of August. Here is a blog post which has photos and descriptions of all the items which have been reported so far. In the comments there is speculation as to who the creator is. There is a longer web version (and shorter print version) about pricing of database packages from academic publishers (mostly). Commonly it is referred to as "the Big Deal." Richard Poynderhas a good explanation and history. In a lot of ways the sub-title says it all: Not Price But Cost. I don't remember where I picked this up, and I have always had a good relationship with IT folks, but I love the headline: Why IT pros should be more like librarians. One of the points that the article makes is about the ability to communicate clearly about what is happening. I'll say that in my present place of work (MPOW), the folks in IT respond quickly to requests, and do keep us informed about what is happening. The first concerns the use of location based services. Stephen is a huge fan, I am not as sure about that. However, it does have implications for library services and as he notes: "libraries have branches and multiple locations because geography is important for face-to-face service, community and learning. That’s one reason why I track location based services so much." And later he says: "I believe that geo-based web services and products will be essential to library strategies in the future." Both of those are statements with which I agree. The second post covers an important topic and has an insightful title: Preparation for Living in a Public World. He wrote the post for the AASL Banned Sites project. As you might expect, he is against schools blocking specific technologies, and suggests that students would be better served if schools taught appropriate sharing behavior. I encourage you to read his post. To follow up on the first of the two items immediately above, smartphones and e-books have been a continuing topic of interest. My friend Michelle Boule writing for ALA Techsource talked about what the growth in smartphone use means for libraries, including library web sites. A good article if you missed it. This post reminds me of why we gather statistics. And the title says it all "Assessment isn’t about the data, it’s about the results." I think, for me, there is another important aspect of assessment which is buried in Jenica's post, and that is the value of anecdotal evidence. David Lee King has a great recent post about the importance of relationship building for libraries (as institutions). It is a great concept, one which I always tried to implement (including in the days before social networking technology). It reminds me of one of my favorite sayings: You can never have too many friends! Abigail Goden who used to work for my friend Rochelle in LaCrosse has started a series in her blog Hedgehog Librarian, called "Data Tidbits." It has been appearing regularly on Fridays. The first one was August 12, and as the name suggests, it is a mish-mash of items. (In this one she suggests following data "queen" Dorothea Salvo on Twitter....I loved reading her blogs, I guess I am going to have to go back to Twitter.) Both the first and the second ones include data jobs as part of the post. Both the third and the fourth ones continue in the same vein. Well worth following. "I quite like using the word 'assets' with reference to library collections." This is the introductory sentence of a post by Lorcan Dempsey. I guess it is my MBA education and activity in the business part of the library that I have always thought of them as assets in the accounting sense. However, Lorcan goes on to say "We tend to think of assets in positive terms, as things that are valuable." I think that may be the more important part of his message. I am not sure where I first picked up on Jennifer Meyer's blog. She is a (the?) librarian at a for-profit college. Her blog is called careercollegelibrary. She posted in a series about some of the perspective from that kind of institution. I was put off a little bit because in the first one, she uses "perspective" when she means "prospective." She does focus on the library's potential role in recruiting students. In her second post, she focuses on retention. This is especially important as higher ed institutions are being judged on graduation rates, and retention is what is needed to keep that rate high. Her third post focuses on the final phase of higher ed, critically important to for-profit institutions and one where they have been most criticized, placement. It is a slightly different take on the world, and I think a blog worth following. Also in the nitty-gritty of the library world, Michelle McLean (Connecting Librarian) talks recently about some of the mechanics of information flow. It is certainly worth a read as you try to manage organizational blogging, tweeting, and other social networking activities. First about my relationship with Michael Gorman. I first met him when I started Library School at the University of Illinois at Urbana-Champaign (UIUC) in June 1975. He was teaching the introductory class for the library school at the end of his first stint in the US. Later, our paths crossed occasionally at ALA, including on ALA Council. At the Midwinter Meeting in 2003, I was nominated for election to the ALA Executive Board. Michael Gorman was nominated from the floor. When we gave our speeches to Council (the extent of our "campaigns"), I was assigned to sit at the end of the table on the podium, with Michael Gorman next to me. Thank goodness I got to speak first! So, why am I blathering on about Gorman? I just finished reading Broken Pieces: A Library Life, 1941-1978. It is his autobiography. I found it fascinating, partly because I know him. It is also very personal and revealing about some of the mental health issues which he faced as he began his library career. Cataloguers (especially those of a "certain age") will find the discussion on the production of AACR2 (Ango-American Cataloging Rules, 2nd edition) most enlightening. As is his style, he is very forthright about his opinions. In this book, most of those opinions related to cataloging issues, from his evaluation of the older rules (pre-AACR) used in both the US and UK, as well as the proposal for a whole new scheme for cataloging methods. He notes that AACR2 probably should not have been called the second edition, but been given a whole new name. Based on what I read in his work, I think I agree. I also agree with his comments about "tagging" versus the controlled vocabulary offered by Library of Congress Subject Headings (even with the shortcomings of LCSH). It will be interesting to see what happens in the cataloging world. I feel better prepared to think about it and talk about it. I think the book is well worth the time to read, even if you do not personally know Michael Gorman.